Wholesale Custom Carabiner Keychain Calculators with Compass, Personalized or Blank. Promotional, Economy. Bargain Prices for the USA and Canada. 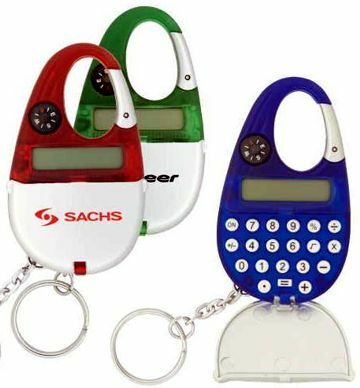 Bulk discount Carabiner Calculator Keychains with Compass, custom imprinted with your logo. We also supply blank (not imprinted) Wholesale Carabiner Calculators for $1.49 each and direct import Carabiner Calculators at lower prices (please scroll below our regular Price Table to see the lower factory direct prices). Budget Prices in the USA and Canada for wholesale Carabiner Calculator s . Free artwork design. American clients pay no taxes, Canadian clients don't pay PST. We will send you a proof for your approval before production. Colors: Translucent Red, Translucent Blue, Translucent Green, Translucent Black: assortment is allowed.